I was recently sent the Dolce and Gabbana 3 L'Imperatrice fragrance from BeautySpin. This product is sold on their website from £26-£33 which is well discounted compared to other retailers. A great feature of the BeautySpin website is that they have thousands of testers of fragrances on their website from as little as 70 pence which allows you to trial out a fragrance before you splurge out and purchase the full sized product. The packaging of this perfume is very sleek and minimalistic which I personally find aesthetically pleasing. The perfume bottle itself is made of very strong glass which feels very sturdy, heavy and expensive to the touch. 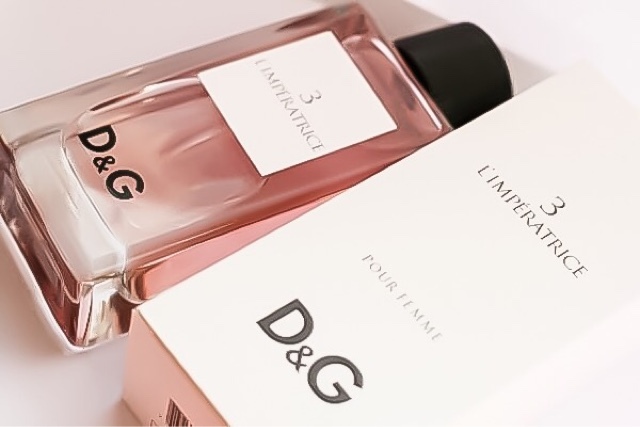 The D&G logo is embossed in bold, black font near the bottom of the bottle and a white label is printed stating the number and name of the fragrance. The lid is also very robust and is a matte black cap with a rigid texture which gives the illusion as if it would be screwed off like a twist cap however that feature is simply for design. This fragrance is a very fruity and floral scent with an aquatic theme running though it. The scent has very strong notes of fruits, in particular kiwi and watermelon, as the fragrance wears on the skin, scents of lemon and musk appear which last well on the skin. This scent is best for day time wear and is most appropriate for in the spring and the summer. I think this will be my go to scent over the next few months. Admittedly, this fragrance does not have the longest staying power and I find myself having to top it up after 4 or 5 hours, but nevertheless the scent does linger just not quite as strong as I would anticipate. I personally love this fragrance for day wear and I think it is perfect for the spring and summer months. I really love these perfume. The best for spring. What a great idea that they offer fragrance samples! I think this would be great for someone looking for a new signature scent and not wanting to spend loads of money just to get it totally wrong! That's what I did when I bought Si by Giorgio Armani on a whim; I ended up hating it and I cringe any time someone comes near me wearing it now! This fragrance sounds right up my street though; I love anything floral or fruity! Definitely a great scent for spring/summer. I tried some on at Sephora but unfortunately it didn't work with my body chemistry. I enjoyed reading your perfume review but I past since its has watermelon and kiwi scents!! This sounds so lovely! I'm actually ok with scents that don't last too long...4 - 5 hours is still pretty good! I find the scents that last 6 hours + start off really strong to begin with. I looooove this scent and always talk myself out of buying it for some reason! You've piqued my interest yet again. I'm not a huge fragrance person but this one sounds so nice! This is such a gorgeous girlie scent! My flatmate wore this all the time when I was in uni so it always reminds me of her. I have a sample but I really need to pick up a bottle, I think it's a pretty good price too!